Which is better - P2P or SCP? KEEP CALM AND GO TO CUBA, it's still legal! Despite the hullabaloo about Trump’s changes to Cuba travel rules in 2017, there wasn’t much impact on legal tourist travel- in some ways it is now even easier. What are you waiting for? You’ve heard that tourist travel is illegal to Cuba, and that’s true, but that doesn’t mean you can’t vacation in Cuba. You just have to fit your “tourist” travel under a general license so the Office of Foreign Assets Control (OFAC), the embargo enforcers, know that your time in Cuba has a “meaningful” purpose. The two most familiar and applicable general license categories for travel are People to People (P2P) and Support for the Cuban People (SCP). The most important thing to keep in mind is that none of the 12 general license categories require approval from the OFAC or filing any kind of permit application. It is self-certification: you state your category to whoever asks (e.g. airline, travel provider, cruise company, US border agent, etc. ), and then make sure you have trip documentation to support that you spent your time as allowed. For all general license categories, you still need a visa which is the Cuban government’s requirement for all tourists. A tourist visa will be fine for most people. The best general license category under the Trump rules is SCP so let’s talk about it first. "Enhance contact with the Cuban people, support civil society in Cuba, or promote the Cuban people's independence from Cuban authorities and that result in meaningful interactions with individuals in Cuba"
With SCP you are not required to be on a tour, but it is highly recommended because time spent with our local tour guides counts towards “meaningful interaction” and “promoting independence”. A guide will help you engage more with the culture and people and avoid the hassles and frustrations that independent travelers face. Cuba is safe, but by no means easy. Besides, even our customers who insist they “not-a-tour-person” say our tours are really fun! That’s it! Do all this and you’re traveling legally to Cuba. While having a signed paper affidavit is not a requirement, we recommend you bring one just in case, because airlines agents and border agents who aren’t experienced in Cuba travel may ask to see one. If you are on one of our tours we will provide you with an affidavit, otherwise if your travel provider (airlines, cruise company, etc) hasn’t given you one, you can just Google “Cuba Travel Affidavit” and download one. Don’t expect any problems leaving or returning to the U.S. very few people are ever questioned about their trip to Cuba or their general license. If these rules start being enforced it will be done by the Office of Foreign Assets Control after you are back home, not by Customs and Border Patrol. The punishment for violation, which hasn’t been levied in many years, is a fine. You will not be prohibited from entering the US, put in jail, or have your passport revoked. These tours require a chaperone that must be a US citizen or resident to accompany you on the tour and make sure you are adhering to the full schedule of activities. The chaperone is usually in addition to the tour guide. This is the most restrictive aspect of P2P and why we don’t recommend it. Due to the chaperone requirement on a P2P tour your time in Cuba is limited to the dates of the tour, participation in activities is mandatory, and the tours tend to be more expensive because you’re paying that chaperone’s travel. The benefit is that you don’t have to keep record of what you’re doing because the chaperone does it for you, and tour provider is taking responsibility for you. Due to the chaperone requirement, P2P is not a viable category for day tours unless you are on a tour provided by the cruise line. If you are a cruise passenger, you want to travel under SCP, which all cruise companies allow. Unfortunately, many cruise agents do a hard sell to make you think you need to be on their shore excursions, or those of a US company, for them to let you off the ship but this is not legally required nor is it actually required by any of the cruise companies we are aware of. You would just select 515.574 Support for Cuban People on the affidavit they provide you. We have had travelers from Royal Caribbean, Carnival, Holland, and Norwegian on our Havana day tours they all have the same process so it’s likely all other cruise lines do it the same way. The main difference between these two categories is that a US chaperone accompanies the P2P tours, while there is no chaperone on the SCP tours. The chaperone is there to make sure the group sticks to the itinerary with its full schedule of included compliant activities and puts the onus of legal travel on the tour provider rather than the individual. With the SCP tours, the travelers themselves need to make a short daily entry in a travel diary to describe their activities each day, so there is slightly less paperwork on a P2P compared to a SCP. However, the cost of sending a chaperone from the US means that the P2P tours are much more expensive. SCP also offers more freedoms to the traveler. On P2P tours generally you cannot stay in Cuba before or after the tour, and participation is mandatory in all the activities. While both categories have similar activity requirements, a SCP tour would allow you more flexibility and discretion to choose how to meet your "full-time schedule". There is no evidence as to which license is scrutinized more closely by the US authorities. Until now, it seems that no travelers at all are being asked to show any detail nor explain their license (other than stating the name of the license) when passing back through immigration on return to the US. In practice neither license can be said to be better from a legal standpoint. Both are fully legal and legitimate ways of visiting Cuba, and while travelers at present aren't being scrutinized nor checked with any rigor, for peace of mind it is always advised to travel under one of the legal categories, and carry and complete the simple and necessary paperwork. SCP tours – These group tours are specially designed for compliance with the Support for the Cuban People category of General License. They use privately owned accommodations and restaurants, and include a full schedule of fun and diverse activities that are appropriate under this license. These tours also include document support to comply with the license, upgraded accommodations, our most experienced Cuban guides, gratuities, and many meals. Our SCP tours help you avoid the hassle and uncertainty of designing your own compliant itinerary and provide you with a fun and authentic Cuba travel experience. Custom Tours - We offer private and custom tours that meet the requirements for either P2P or SCP. For these tours you can decide the date and itinerary. Contact us for a quote. Other Tours & Services - For travelers who prefer to decide their own activities, we offer basic group tours that include accommodations, guide, and transportation. The accommodations comply with legal travel, however the meals and activities are not included, so you need to pay for these locally. You are responsible for choosing only restaurants and activities that comply with the travel regulations. Our guides and staff on these basic group tours do not provide additional support during the tour to help you complete the paperwork for the license. 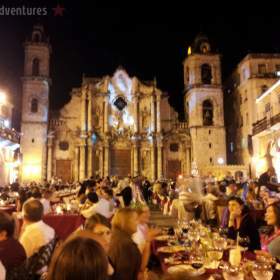 If you prefer to stay just around Havana we also offer tour guide services and day tours. All of the tours and services we offer are appropriate for SCP - since they support privately owned business – but make sure the rest of your time complies with the regulations and that you complete the necessary paperwork. SCP and P2P are the best categories for general tourists, but if you have a special purpose for being in Cuba one of the other 12 categories may be best for you. Many people think educational is an easy category to comply with but it is actually quite restrictive, so make sure you understand the requirements of the license you select. Here are most of the categories of legal Cuba travel for the general license, ordered from most used to least used. For full description of the categories visit the OFAC website. Support for the Cuban people by human rights organizations, independent organizations, individuals, and NGOs. This is the category that allows individuals to travel legally, as long as they use private businesses and maintain a full schedule of meaningful activities (§515.574). See previous section for this category. Educational activities. Section (a) is for college, university and secondary school faculty, staff, students, and chaperones. Academic research specifically relating to Cuba and for the purpose of a graduate or undergraduate degree. Faculty and staff can visit Cuba independently to research and prepare for student trips. Note: This generally requires a formal course of study, so just taking Spanish lessons wouldn't qualify. Section (b) is for non-academic people to people travel on chaperoned group tours (§515.565). See previous section for this category. Each individual in your party (even children!) must qualify for a general license on their own. OFAC requires that you maintain specific records of your travel to Cuba, regardless of whether you are traveling under a license or not, and to keep these records for 5 years in the (highly unlikely!) event that OFAC requests to see them. Hang on to any receipts and documents relating to transactions or purchases for your trip to Cuba, along with any itineraries and other support for your purpose for travel. You don't need to worry about showing your license anywhere except the US when returning from your trip. Other countries aren't in the practice of enforcing the US travel embargo, so don't expect anyone in Cuba, Mexico, Canada, etc. to have any idea of what you're talking about if you mention the license. You only need to show your license if an official asks to see it. This has rarely been requested in the past but Trump has told OFAC to start enforcing these regulations so make sure you have these documents in your files for 5 years. If you received a passport stamp in Cuba, don't worry- you are traveling legally! Check out the OFAC website for more information. Traveling on an individual General License? Our regular groups tours offer plenty of freedom for you to pursue your general license activities while providing a foundation for a hassle-free travel. Whether you travel independently or on one of our other tours we can provide flights to Cuba, transportation, accommodations, tour guide services, Santiago day tours, and Havana day tours, to make your trip to Cuba easier and more enjoyable.